Cathedral of Vilnius with its Bell Tower on Cathedral Square. The Gediminas' Tower of the Upper Castle can be seen above the roof of the cathedral. 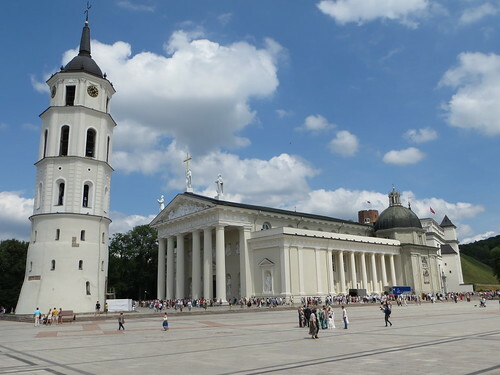 Vilnius Cathedral is the main Roman Catholic Cathedral of Lithuania, the current building was constructed between 1779 and 1783, in a Neoclassical style, on the ruins of an older cathedral. The Bell Tower was built in 1522, on top of the Lower Castle defensive tower.